Here in Sandpoint, Idaho, many people are trying to live green. Lots of people move here to surround themselves and their family with a beautiful, healthy, clean environment. R.W. Bianco did that in 1980 and has been here since. When it comes time to build a home, many people consider what they can do during construction and beyond to be responsible homeowners. The idea is simple: use building and construction techniques that minimize negative impact to our precious environment. So why does it get so confusing? It doesn’t need to be. R.W. Bianco Construction has been building green for many, many years, even before being sensitive to the environment was in vogue. Let us help you see through the “greenwashing” so prevalent today. We are uniquely qualified to make sure your desire to build a green home can be a reality. And it need not cost a fortune. We are talented at being practical and realistic. As we listen to what you want from your home, we will offer solutions to fit not just your dreams but your budget. Green building is made up of many components. Many homeowners are most concerned with cost, and that makes sense to us. Often, we offer clients a variety of solutions for their project, from very, very little impact on the site to a slightly greater impact for a more affordable price. The choice is yours, we are here to explain every option and find the solution that has the smallest carbon footprint but also suits your family best. Another important aspect is local sourcing. What is better: buying a door made in Sandpoint of reasonable materials or buying a 100% biodegradable door from Sarasota, Florida and having it trucked to Sandpoint, using fossil fuels all the way? R.W. 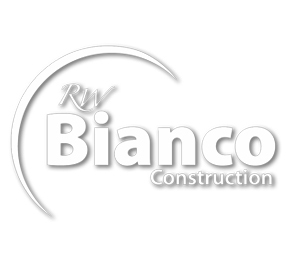 Bianco Construction will consult with you throughout the process to come up with the most green materials we can source while keeping other environmental factors in mind. Materials in building have traditionally been quite industrial and often, caustic for the environment. We keep abreast of the many innovative and environmentally friendly materials now becoming available in the industry. What’s more, we can show you around homes where we’ve put them to use. We work with architects who are well-versed in green architecture and custom home building. They are professionals whose commitment to green construction is one of the factors we research when deciding if an architect is an ally. R.W. Bianco Construction also creates dynamic and creative architectural design in-house. We invite you to test and check us: we have been committed to being environmentally friendly builders for years. Please pick our brains, we can come up with creative solutions to practical problems you might not even expect. LEED (Leadership in Energy and Environmental Design) is the certification one gets from the U.S. Green Building Council.